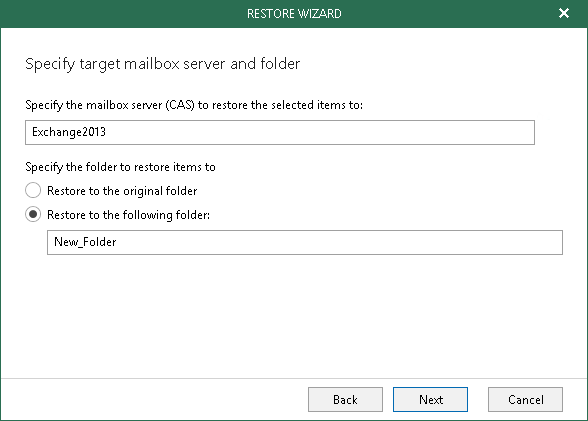 At this step of the wizard, specify the target mailbox server and a folder to which you want to recover your data. If the specified folder does not exist on a target server, it will be created under the root mailbox node which is being restored. When restoring public folders, security permissions will be restored to their original settings. Hard deleted items from public folders will be restored to their original location. Hard deleted items from the mailbox (shown in the Permanently Deleted Items folder) by default, will be restored to the original location. You can also specify a different location — if it does not exist on target, it will be created. To restore Online Archive mailbox items, make sure the corresponding Online Archive mailbox is configured on a target server. Online Archive mailbox items can be restored to the original folder (for example, Online Archive > User1 > Drafts) or to a different folder — if it does not exist on target, it will be created.